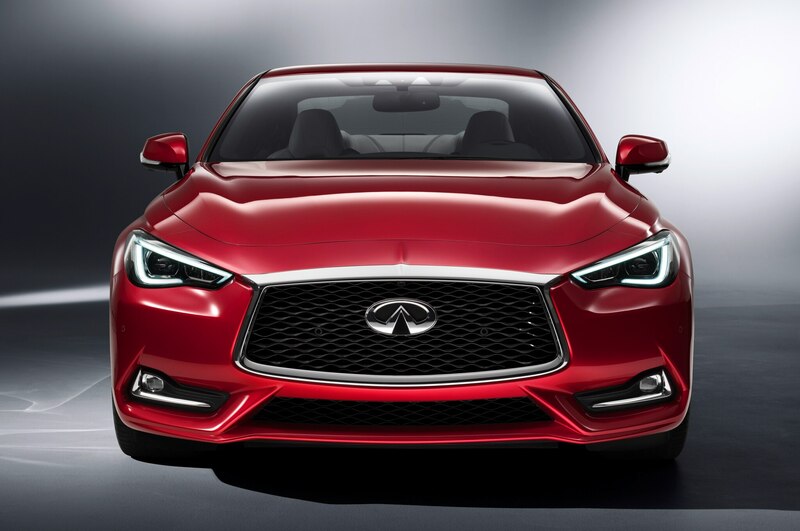 The sultry two-door Q50 arrives to take on the C-Class and 4 Series. It’s always a pleasant relief when automakers can translate their wild concept cars into production models, and especially so when the result looks as good as this. 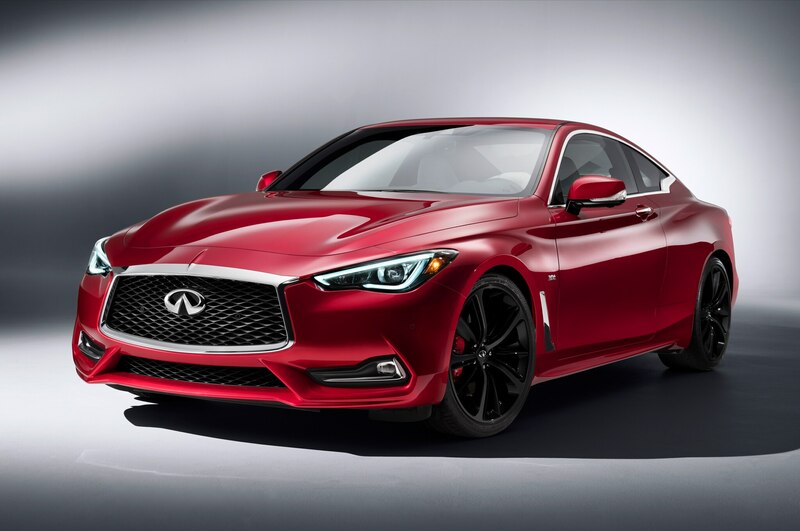 The 2017 Infiniti Q60 coupe, shown a year ago in Detroit as a concept car, makes its public debut at the 2016 Detroit auto show with expressive styling and a powerful twin-turbo engine, ready to take on the Mercedes-Benz C-Class coupe and BMW 4 Series. 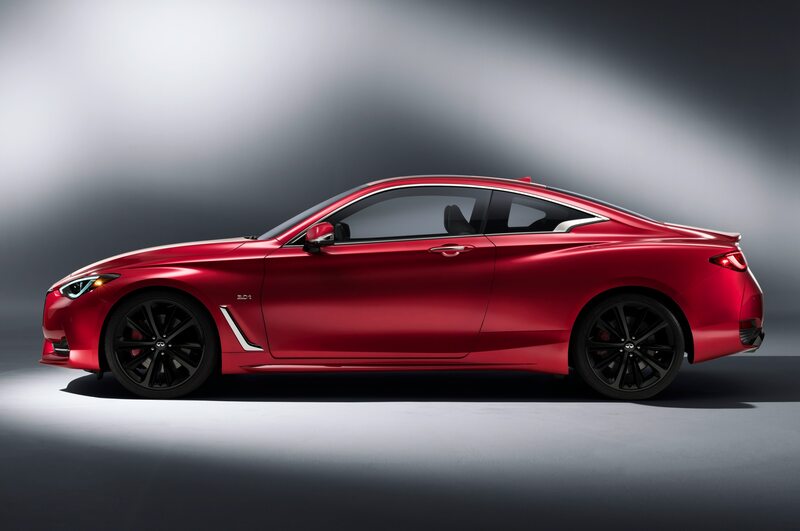 Just like the concept — and the model we spotted during an ad shoot late last year — the production 2017 Infiniti Q60 is a knock-out. 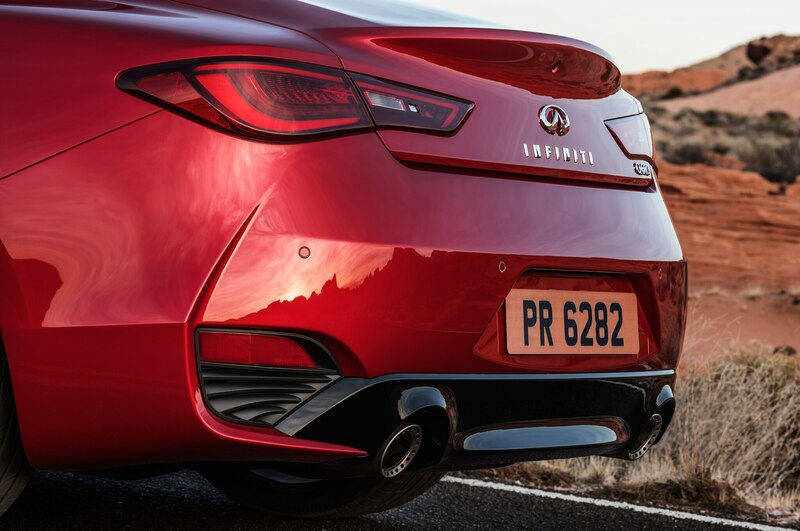 Lower and wider than the outgoing Q60 (née G37), the Q60’s rippling sheetmetal spills out onto flared fenders. Deep-draw body stamping allows creases and curves everywhere, with nary a straight line or flat panel to be seen. 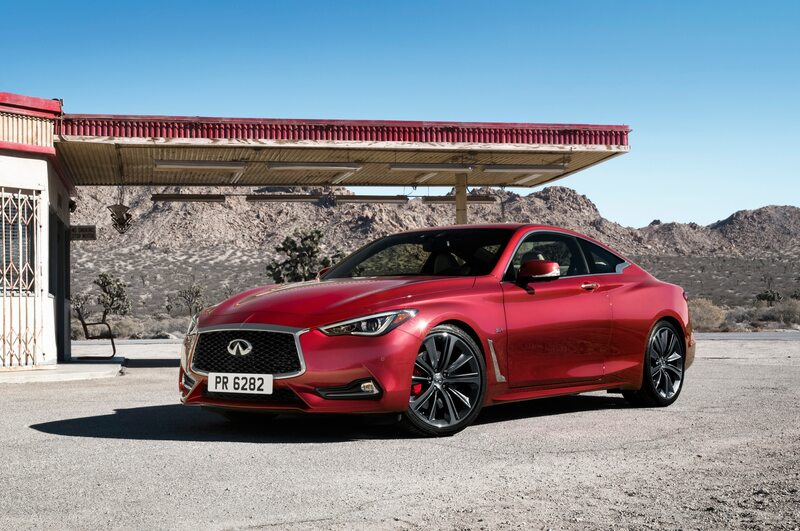 It’s a muscular, aggressive look that stands up well against the design of the Q60’s German rivals. 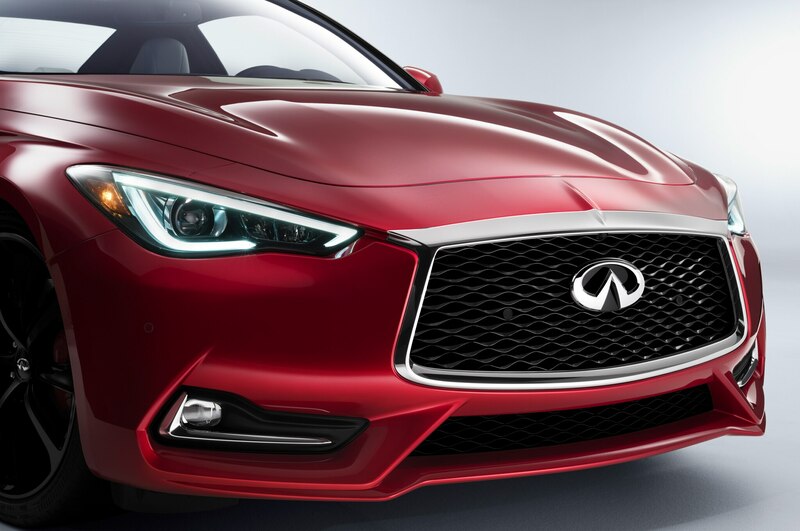 Out front, Infiniti’s familiar wide-mouth grille sits above a trio of narrow air intakes. Triangular headlight housings extend onto the front fenders, as the car’s primary shoulder line emerges from the front of the hood to run the entire length of the body. 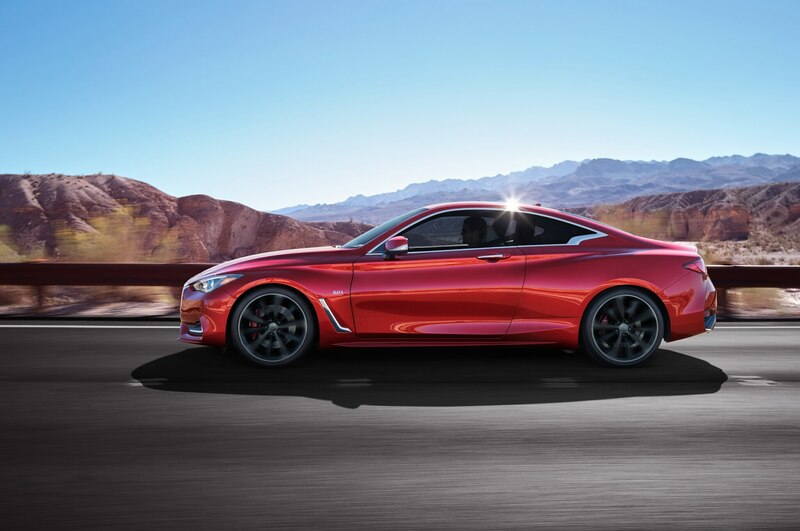 The roofline plunges toward a rounded trunklid with integrated lip spoiler. The car’s C-pillar has Infiniti’s signature crescent-cut window cutline. 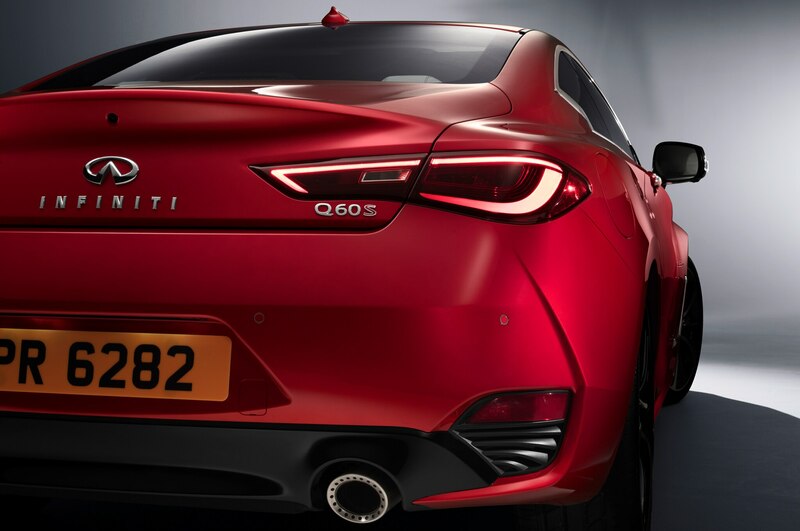 Two fat, circular exhausts poke out from either side of the gloss-black rear diffuser panel. 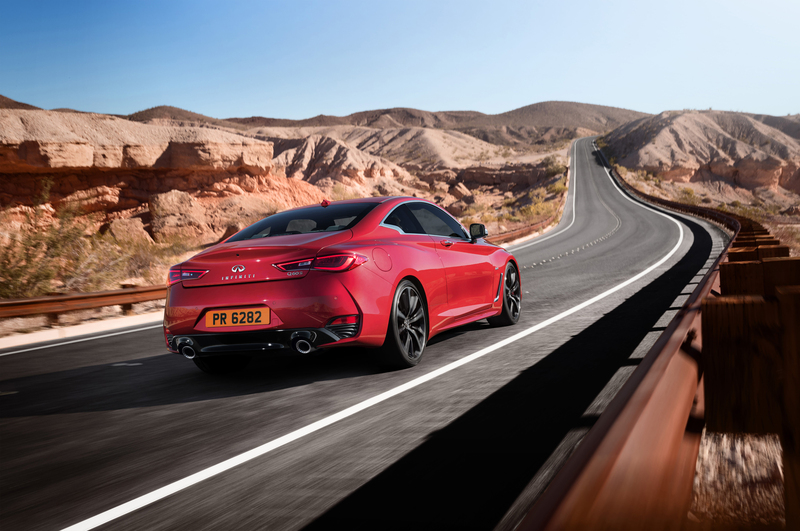 There’s enough power to back up those looks, too, with the 2017 Infiniti Q60 packing a new 3.0-liter twin-turbo V-6 engine (also available in the Q50 sedan) producing either 400 hp and 350 lb-ft of torque, or 300 hp and 295 lb-ft, depending on configuration. There is also a 208-hp, 258 lb-ft, 2.0-liter inline-four gas engine; all three send their power through a seven-speed automatic transmission to either the rear or all four wheels. 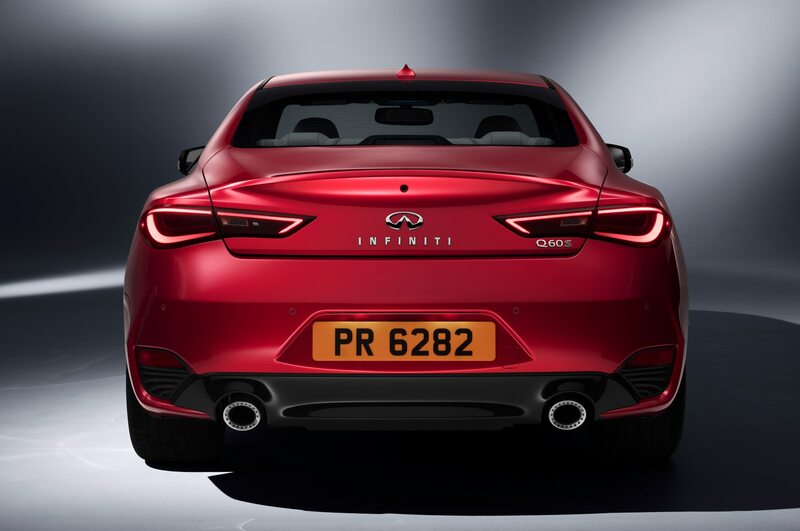 Despite how much power is offered, Infiniti claims the Q60 will still be very fuel efficient, thanks in part to a slipper 0.28 drag coefficient. The company expects 24 mpg combined for the four-banger, 23 mpg for the 300-horse engine, and 22 mpg for the 400-hp mill. 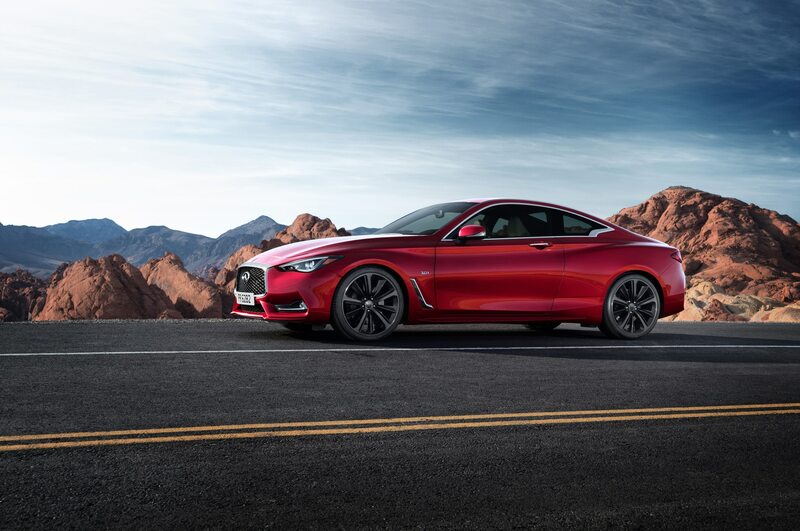 As standard, the 2017 Infiniti Q60 comes standard with electric power steering with the 3.0-liter engine and electrohydraulic steering for the 2.0-liter engine. Infiniti’s Direct Adaptive Steering steer-by-wire technology is available as an option on the twin-turbo engine; we reviled the setup’s vagueness in our Four Seasons 2014 Infiniti Q50, but the company says it has “undergone significant re-tuning to enhance steering feel and feedback.” We’ll have to get behind the wheel to see whether we’re happier with the all-electric system in the Q60. 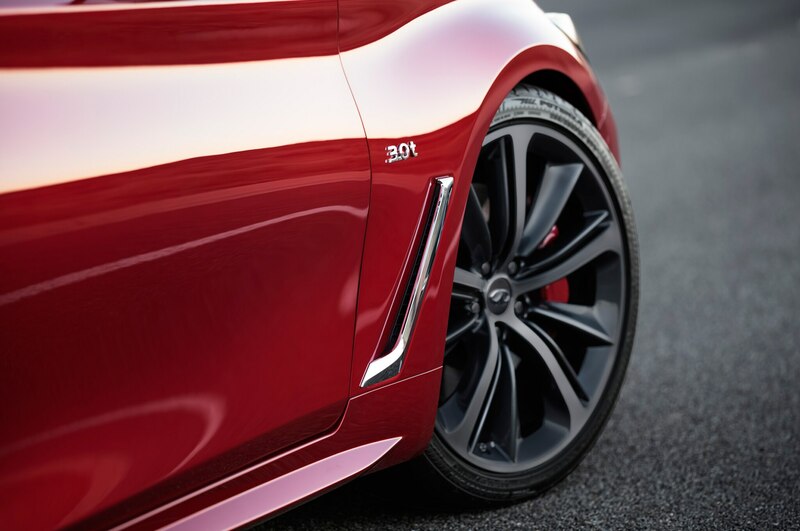 Beneath the surface, Infiniti says the Q60 has unique bushing, spring, and damper tuning for “optimized sports coupe ride and handling.” There is also an optional Dynamic Digital Suspension system with multiple settings for the adaptive dampers, allowing drivers to pick between a more comfortable ride and racier, more poised handling. Models with the 3.0-liter engine also receive a staggered tire setup, as well as active grille shutters to reduce aero drag when engine cooling needs are low. 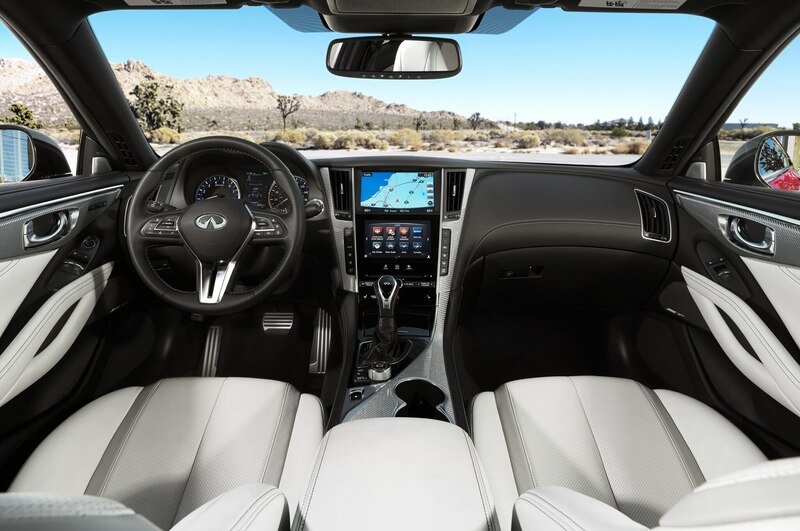 The inside of the 2017 Infiniti Q60 looks pretty much just like its Q50 sedan sibling. 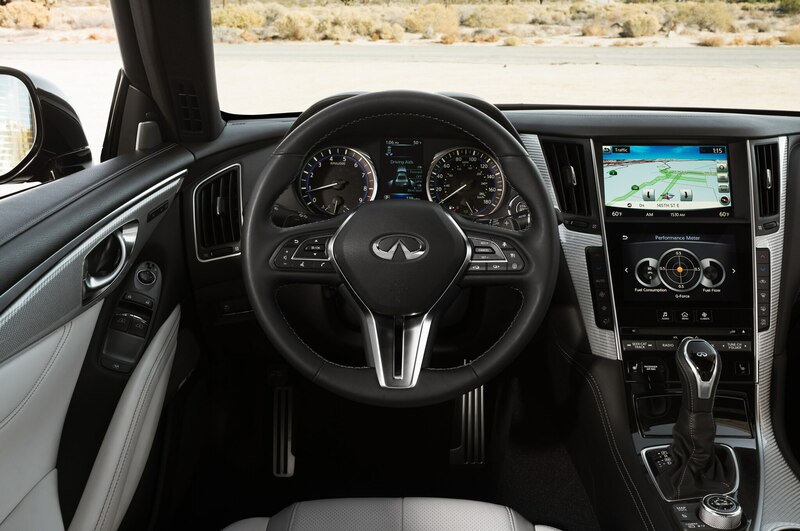 A pair of large touchscreens dominate the center stack, with stylish and high-quality materials arrayed around the snug 2+2 cabin. 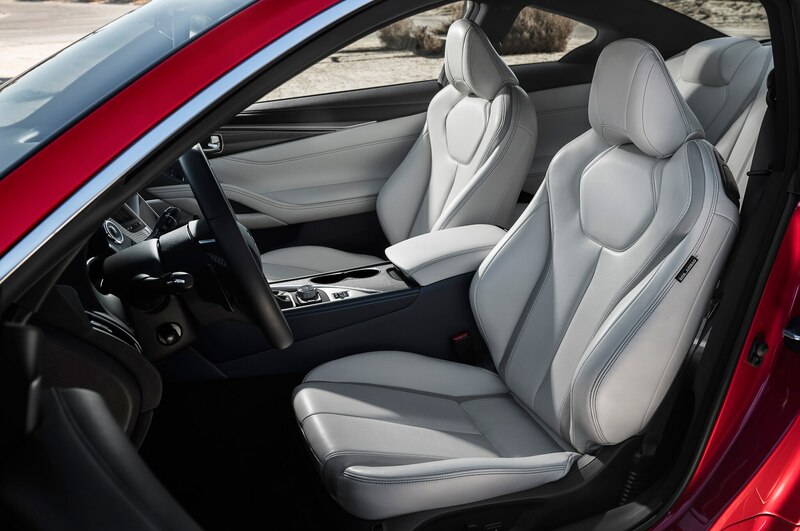 The seats have high backs, bolstering at the sides, and Infiniti’s special “spinal support” design that is intended to reduce pressure on the occupant’s lower and upper back. An active noise cancellation system is standard. Available safety gear includes an AroundView 360-degree camera, adaptive cruise control, pre-collision braking, lane-departure prevention, and blind-spot warnings. 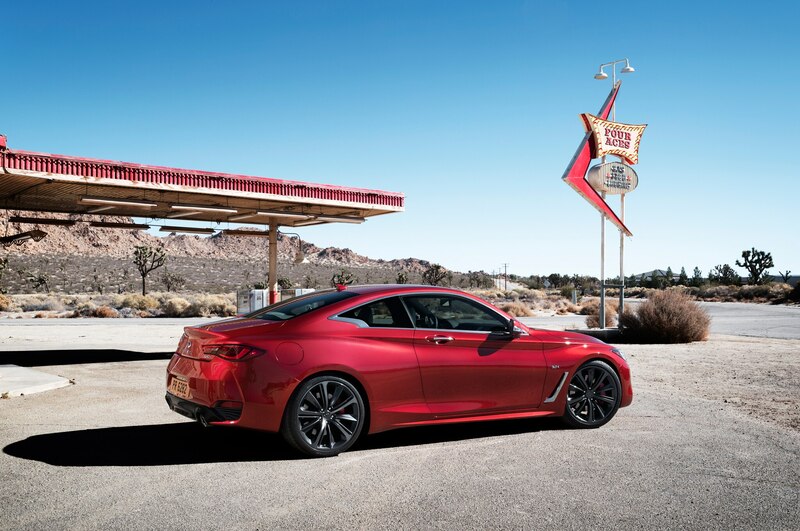 A sports coupe, of course, is more than the sum of its parts, so we’ll want to drive the 2017 Infiniti Q60 back-to-back with the best sports coupes around, including the C-Class, 4 Series, Cadillac ATS, and Lexus RC. 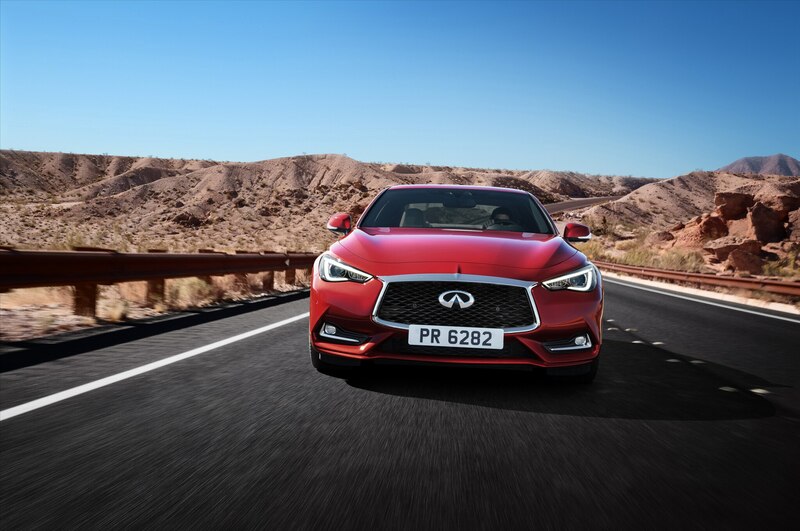 But with gorgeous styling, a beefy twin-turbo engine, and a long list of safety tech, the Q60 looks like a strong contender in the popular segment. 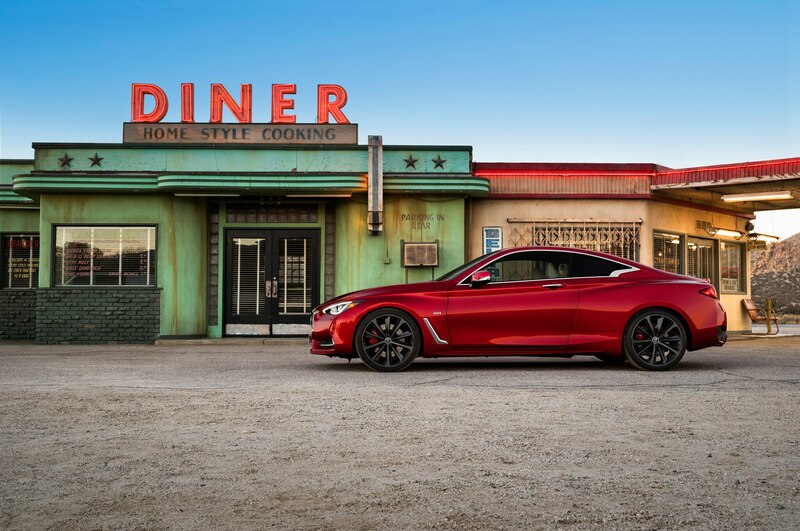 The Q60 is on sale later this year.